Although the second day of advance had produced heavier enemy fire and local counterattacks, General Walker's forces had little reason to lose enthusiasm for their renewed offensive. All divisions had gained ground. In the I Corps zone, the 24th Division, having occupied Chongju, was on the Eighth Army's first phase line, and the ROK 1st Division was close to it. In the IX Corps zone, the 25th Division was not far from Unsan, and the 2d Division had made progress in the Ch'ongch'on valley. Despite rougher going in the Taebaek ridges farther east, the ROK II Corps also had pushed forward. Two miles behind the 9th Infantry, the headquarters, tank company, and 1st Battalion of the 23d Infantry occupied a position arching from the lower bank of the Ch'ongch'on eastward across the valley road. Col. Paul L. Freeman, commander of the 23d, had taken these forces forward during the day under General Keiser's order to pass through the 9th Infantry on the 26th. When Keiser later postponed this change, Colonel Freeman held his remaining battalions near Kunu-ri and deployed his leading units behind the 9th, amid the firing positions of three artillery battalions supporting the division's advance. sion, one enemy regiment advanced in several columns toward the two battalions of the 9th Infantry west of the Ch'ongch'on. Moving mostly over valley trails, the Chinese missed the 2d Battalion's hilltop positions, which were farthest north, but found either the front or flanks of the three separated companies of the 3d. At the sound of bugle signals, the Chinese in file changed formation for assaults that through the night gradually pressed the 3d Battalion toward the river. Other columns of the same regiment infiltrated the gaps between companies and waded the cold Ch'ongch'on to hit the 1st Battalion, 23d Infantry, and the 61st Field Artillery Battalion just north of Colonel Freeman's position.17 The strike startled the 61st into retreat, especially the members of Battery A, who, after their commander had been killed and all other battery officers wounded, abandoned both guns and vehicles. A few artillerymen withdrew eastward, but most of them, with Chinese following, moved south over the valley road through Colonel Freeman's position. Though the confused southward rush of American artillerymen and Chinese infantry complicated the defense, Freeman's forces eventually beat off the Chinese without losing ground. Seeking both cover from Freeman's fire and a position on which to reorganize, the Chinese pulled away and climbed a low but rugged mountain, called Chinaman's Hat, located northeast of Freeman and immediately below the rearmost position of the 1st Battalion, 9th Infantry. In company with the attack from the northwest, a second Chinese regiment struck south along the east side of the Ch'ongch'on. While some of its searching columns hit and hurt the Ist Battalion, 9th Infantry, another moved behind that battalion through the halfmile gap between the 9th and 38th Regiments. Part of the forces reaching the rear area overran the 1st Battalion command post and aid station, then climbed Chinaman's Hat to join the forces who had broken away from the 1st Battalion, 23d Infantry. Following this juncture, the Chinese moved off the Hat and again attacked Colonel Freeman's battalion, focusing this time on the refused right flank east of the valley road. Freeman lost part of his flank position but then shifted forces to the east and blocked the assault. Near dawn, the Chinese again withdrew to Chinaman's Hat. Farther east, some of the Chinese entering the gap between regiments discovered and assaulted Company G, 38th Infantry, holding a detached position at the west end of the 38th's line. About 2330 a third enemy regiment opened an attack against the 38th's center, part of it surrounding and engaging Company A north of the Paengnyong, the bulk crossing the river to attack at the boundary between the 2d and 3d Battalions. Pressing frontal assaults against the central companies, F and L, the Chinese invested portions of the company positions, then called off their attack near 0230 after suffering heavy casualties. Companies I and K to the east. Col. George B. Peploe, the regimental commander, countered near dawn, attacking with his reserve 1st Battalion, less Company A but with Company C of the 2d Engineer Combat Battalion attached as the third rifle company. Starting from a point west of the enemy penetration and moving east into the Chinese flank, the 1st Battalion cleared the area sufficiently to permit Colonel Peploe to restore his central positions. By noon Peploe knew that his problem was much greater than just holding a road-poor interior position with reduced forces. Fragmentary reports made it clear that the ROK II Corps had been under attack for some time, that the South Koreans were not holding their positions, and that the 38th Infantry was fast becoming the right flank unit not only of the 2d Division and the IX Corps but also of the Eighth Army. Peploe's adjustment, of course, protected the flank only at the immediate front. As reports of the ROK II Corps failure reached army headquarters, General Walker moved against the possibility of deeper incursions from the northeast. Far East Command G-2, tended to agree. Reporting to Washington around noon on the 26th, he stated that "should the enemy elect to fight in the interior valleys, a slowing down of the United Nations offensive may result. "33 The Chinese, meanwhile, prepared to continue what they called their Second Phase Offensive. portunity to envelop the 25th Division from the west. This open flank was only one of the problems facing the IX Corps: as the threat developed on the west, the 39th and 40th Armies pressed the main attack against the 25th and 2d Divisions from the north, and the 38th Army started west toward the 2d Division to exploit its previous successes against the ROK II Corps. The position of the Turkish brigade, regardless of Yasici's error, and the positions of the 1st Cavalry Division and ROK 6th Division out along the Sunch'on road provided at least some protection against an envelopment by blocking the likely axes of enemy approach. 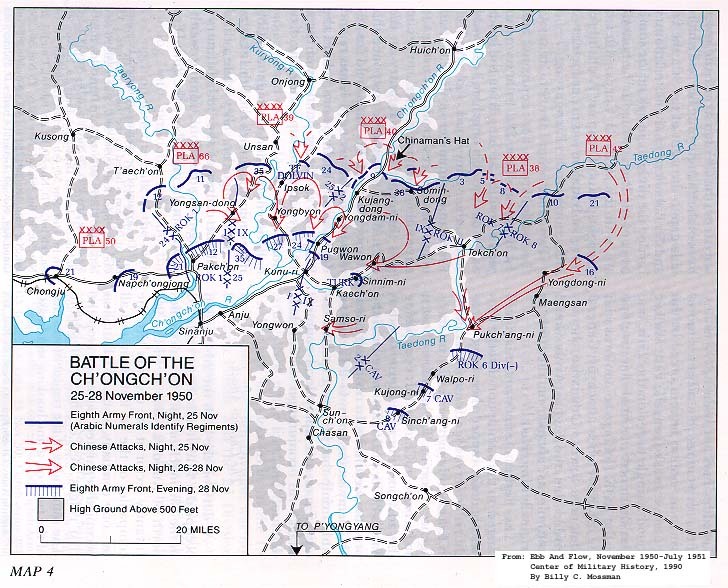 By morning of' 28 November, in any case, General Walker's attention was diverted to his northern front where during the night and early morning hours his forces again absorbed strong attacks near Taech'on, in the Ch'ongch'on valley, and at the army east flank. the 25th Division. Situated at the intersection of roads serving the flank units of the two divisions, Yongsan-dong was a choice objective. Its seizure not only would cut both routes but also would give the Chinese access to good roads leading to Ch'ongch'on River crossings some fifteen miles to the south and southeast near Anju and Kunu-ri. The 66th Army enjoyed rapid success against the reduced numbers of the ROK 11th and 15th Regiments. Attacking east and south, the army occupied Yongsan-dong and, before easing its attack near dawn, drove the South Koreans one to two miles below the village. The ROK ground loss, as on the day before, uncovered the left flank of the 25th Division. The flank was exposed at the same time that the 39th Army pushed a strong attack down the west side of the Kuryong against the 35th Infantry. The total result of the Chinese attacks against the I Corps through the night of the 27th was a wedge driven about five miles between the Taeryong and the Kuryong. Any deepening of the wedge portended the isolation of General Milburn's forces west of the Taeryong and the envelopment of those behind the Kuryong. Keiser was unable to get all of his units into their new positions on the 28th because of the time consumed in moving four regiments down the Ch'ongch'on valley road. Much of the time the road between Kujang-dong and Kunu-ri was the scene of a tight traffic jam. The 38th and ROK 3d Regiments led the withdrawal. Breaking away from Chinese pressing from the north and east, Colonel Peploe took his forces west to Kujang-dong, then south to an assembly about a mile east and slightly south of Kunu-ri. Since it was then 2000, he elected to await daylight before occupying his new positions above Kunu-ri. Behind Peploe, the 9th Infantry recrossed the Ch'ongch'on onto the valley road and marched south to Pugwon, arriving about 2300. From Pugwon, Colonel Sloane deployed his 1st Battalion on the west side of the Ch'ongch'on opposite the town and to the immediate right rear of the 24th Infantry, 25th Division. Below the river, Sloane's 3d Battalion occupied high ground a mile south of Pugwon and the 2d Battalion blocked the valley road from positions a mile above town. hind the 2d Battalion, 9th Infantry, at 2330. Not long after midnight, 38th Army forces reached Sinnim-ni and reopened their assaults against the Turks. Hence, both Wawon and Pugwon, the anchor points of the line assigned to the 2d Division, were gone. General Keiser's alternative would be to organize defenses closer to Kunu-ri, how close depending on the outcome of the continuing attacks on both flanks. Southeast of the Turks, General Gay moved none of his cavalrymen forward to the ROK 6th Division's position three miles below Pukch'angni. Although Gay had been instructed to do so on the 28th, he elected to wait until the 5th Cavalry, then marching south out of the Kunu-ri area, completed its move into the division's sector. Gay's delay in reinforcing the ROK 6th Division below Pukch'ang-ni, the Turk withdrawal from Wawon, and the loss of Pugwon in the Ch'ongch'on valley all worked against the rather high hopes General Walker held for the line he had delineated. While calling for the withdrawal to that line, he also had instructed his forces to prepare for "the Eighth Army resumption of offensive at early date. "71 With a bridgehead over the Ch'ongch'on and with all main roads blocked, he hoped that he could turn back the Chinese and then revitalize his own march to the border. The Turkish brigade's engagements with 38th Army forces at Wawon made it clear that the northern wing of the XIII Army Group's enveloping force was headed for Kunu-ri. From all the evidence reaching the army G-2 on the 28th, Colonel Tarkenton judged that the Chinese would sustain their pressure against Kunu-ri and would attempt to envelop the Eighth Army via the Sunch'on road. He placed in a "maybe"
category a deep enemy strike at Pyongyang through Songch'on. The possibility of these maneuvers was increased by the findings of observers flying over enemy territory above Tokch'on. In that area they sighted a "continuous train" of enemy troops moving south in small groups through gullies, down ridgelines, and over all roads and trails.74 The commander of the XIII Army Group obviously knew the maxims of offensive operations. Having gained an advantage over Walker by turning the Eighth Army's east flank, he now was hurriedly reinforcing his effort in the zone where so far he had achieved the greatest success. General Walker, understandably, was not particularly concerned at the moment over one roadblock that had troubled one regiment. As the situation stood late on the 28th, the chances that the Chinese pushing in from the east could capture Kunu-ri and Sunch'on were good. Walker's problem and larger interest therefore was to prevent the Chinese from isolating the bulk of the Eighth Army by cutting westward across its rear. The obvious answer was a withdrawal, one deep enough to take the Eighth Army below the Chinese thrusts from the east. 1 Eighth Army PIRs 118-135, 7-24 Nov 50. 2 Eighth Army Opn Plan 15, 14 Nov 50; Eighth Army WD, Sum, Nov 50; Fox, "Inter-Allied Cooperation During Combat Operations"; Eighth Army G3 Situation Overlay, 23 Nov 50; I Corps POR 216, 23 Nov 50; IX Corps WD, vol. II, an. 3, Nov 50. 3 Eight Army Opn Plan 15, 14 Nov 50; Eighth Army WD, Sum, Nov 50; Fox, "Inter-Allied Co-operation During Combat Operations." 4 Eighth Army WD, Nar, Nov 50; I Corps Opn O 4, 18 Nov 50; I Corps Opn Dir 23, 19 Nov 50; IX Corps Opn Plan 3, 18 Nov 50; IX Corps Opn Dir 8, 20 Nov 50; IX Corps Opn Dir 9, 23 Nov 50; ROK Opn Plan 5 (Overlay), and Rpt of Staff Visit to II ROK Corps on 23 Nov 50, both in IX Corps G3 Spot Rpts, Nov 50. 5 Eighth Army PIR 135, 24 Nov 50; I Corps PORs 219 and 220, 24 Nov 50; 24th Div WD, Nov 50; 24th Div 0170, 19 Nov 50; 21st Inf Unit Rpts 138 and 139, 23 and 24 Nov 50. 6 The task force, led by Lt. Col. Welborn G. Dolvin, commander of the 89th Medium Tank Battalion, included Company B, the Assault Gun Platoon, and the Reconnaissance Platoon of the 89th; the 25th Reconnaissance Company; Company E, 27th Infantry; Company B, 35th Infantry; and the 8213th Ranger Company. 7 25th Div OI 18, 20 Nov 50; 25th Div Opn O 15, 21 Nov 50; 25th Div WD, 24 Nov 50; 25th Div Nar Rpt, Nov 50; 35th Inf Opn O 19, 22 Nov 50; 35th Inf Hist Rpt, Nov 50; 35th Inf Unit Rpt 43, 24 Nov 50; 24th Inf Opn O 20, 22 Nov 50; 24th Inf WD, 24 Nov 50; 24th Inf Unit Rpt 54, 24 Nov 50; IX Corps G3 Spot Rpts, Entries 1479 and 1491, Nov 50; IX Corps G2 Spot Rpts, Entry 241915 Nov 50, Interrogation of Released U.S. PW (Capt Ray J. Yantis). 8 2d Div Opn O 10, 20 Nov 50; 2d Div WD, Nar, Nov 50; 2d Div G3 Jnl, 23-24 Nov 50; 38th Inf Opn O 20, 22 Nov 50; 38th Inf Nar Sum, Nov 50; 9th Inf Hist, Nov 50, Incl H.
9 Eighth Army POR 406, 24 Nov 50; IX Corps Sit Overlay, 242400 Nov 50; IX Corps G3 Spot Rpts, Entry 1535, 24 Nov 50; 2d Div G3 Jnl, Entry 113, 24 Nov 50. 10 I Corps Opn Dir 24, 241800 Nov 50; I Corps POR 222, 25 Nov 50; 21st Inf Unit Rpt 140, 25 Nov50. 11 I Corps POR 222, 25 Nov 50. 12 25th Div WD, 25 Nov 50; 35th Inf WD, Nar, Nov 50; 35th Inf Unit Rpt 44, 25 Nov 50; 24th Inf Unit Rpt 55, 25 Nov 50; IX Corps PIR 60, 25 Nov 50; 2d Div WD, Nar, Nov 50; 2d Div G3 Activ Rpt, Nov 50; 2d Div G3, Jn1, Entry 32, 25 Nov 50; IX Corps WD, 25 Nov 50; IX Corps POR 183, 25 Nov 50; Eighth Army POR 408, 25 Nov 50; Eighth Army G3 Jnl, Entry 1525, 25 Nov 50. 13 Eighth Army POR 409, 25 Nov 50; Eighth Army G3 Jnl, Entry 1955, 25 Nov 50; Eighth Army PIR 136, 25 Nov 50; Eighth Army G2 SS Rpt, Nov 50; Eighth Army G3 Jnl, Briefing for CG, 25 Nov 50; IX Corps PIR 60, 25 Nov 50; IX Corps G3 Spot Rpts, Entry 1607, 25 Nov 50. 14 Eighth Army G1 SS Rpt, 25 Nov 50; Rad, GX 30007 KGOO, CG Eighth Army to C/S ROKA et al., 25 Nov 50. 15 Eighth Army PIR 136, 25 Nov 50. 16 The account of the opening enemy attacks against the 2d Division is based on the following sources: IX Corps G2 Spot Rpts 2990, 2997, and 3026, 26 Nov 50; 2d Div PIR 68, 26 Nov 50; 2d Div G3 Jul, 26 Nov 50; 2d Div Arty WD, 26 Nov 50; 2d Div Arty POR 94, 26 Nov 50; 1st Cav Div G3 Jnl, Entry 15, 26 Nov 50; 9th Inf Hist, Nov 50; 9th Inf PIR 75, 26 Nov 50; 1st Bn, 9th Inf, WD, Nov 50; 2d Bn, 9th Inf', Unit Jnl 26 Nov 50; 3d Bn, 9th Inf, Nar Diary, 25 Nov 50; 23d Inf', Nar Sum, Nov 50; 23d Inf WD, Nov 50; 38th Inf' Comd Rpt, Nov 50; General Charles D. Palmer, MS review comments, 1985. General Palmer was the division artillery commander of the 1st Cavalry Division at the time of the action. 17 The 61st Field Artillery Battalion was a 1st Cavalry Division unit that had been attached to the 2d Division to provide additional direct support to the 9th Infantry. 18 25th Div WD, 25-26 Nov 50; 25th Div PORs 64 and 65, 26 Nov; 25th Div PIR 150, 26 Nov 50. 19 25th Div WD, 26 Nov 50; 25th Div 0120,26 Nov 50. 20 25th Div WD, 26 Nov 50; 25th Div 0 121, 26 Nov 50; 24th Inf WD, 26 Nov 50; 1st Bn, 24th Inf, WD, 26 Nov 50; 27th Inf Hist Nar, Nov 50; 27th Inf Unit Rpt 82, 26 Nov 50. 21 2d Div WD, Nov 50; 2d Div G3 Jnl, 26 Nov 50; 9th Inf Hist Nar, Nov 50. 22 2d Div WD, Nov 50; 2d Div G3 Jnl, 26 Nov 50; 2d Div Arty S3 Jnl, 26 Nov 50; 23d Inf, Nar Sum, Nov 50; 23d Inf WD, Nov 50. 23 2d Div WD, Nov 50; 2d Div G3 Jnl, 26 Nov 50; 38th Inf Comd Rpt, Nov 50. 24 38th Inf Comd Rpt, Nov 50. 25 Eighth Army WD, G3 SS Rpt, 26 Nov 50; Eighth Army G3 Jnl, 26 Nov 50; Eighth Army POR 410, 26 Nov 50; IX Corps PIR 61, 26 Nov 50; IX Corps G2 Spot Rpt 2982, 252255 Nov 50; IX Corps G3 Spot Rpt , 1692, 260800 Nov 50. 26 Eighth Army G3 SS Rpt, Briefing for CG, 26 Nov 50; IX Corps PIR 61, 26 Nov 50; IX Corps PIR 62, an. 2, 27 Nov 50; 2d Div G3 Jnl, 26 Nov 50. 27 Eighth Army G3 Jnl, 26 Nov 50; Eighth Army G3 SS Rpt, 27 Nov 50; IX Corps G2 Spot Rpt 3050, 261505 Nov 50. 28 38th Inf Comd Rpt, Nov 50. 29 Rad, GX 30017 KGOO, CG Eighth Army to CG 1st Cav Div et al., 26 Nov 50; Eighth Army POR 412, 26 Nov 50; Eighth Army G3 SS Rpt, 26 Nov 50; Eighth Army G3 Jnl, 27 Nov 50. 30 Rad, GX 30019 KGOO, CG Eighth Army to CG IX Corps, 26 Nov 50; Rad, GX 30022, CG Eighth Army to CG I Corps et al., 26 Nov 50. 31 24th Div WD, 26 Nov 50; I Corps POR 225, 26 Nov 50. 32 Eighth Army PIR 137, 26 Nov 50. 33 Schnabel, Policy and Direction, p. 274. 34 USAFFE Intel Dig, vol. 1, no. 4, 1-15 Feb 53. 35 Ibid. ; 24th Div WD, 27 Nov 50. 36 I Corps PIR 73, 27 Nov 50; I Corps PORs 227 and 228, 27 Nov 50. 37 Ibid. ; 24th Div WD, 27 Nov 50. 38 25th Div PIR 131, 27 Nov 50; 25th Div PORs 67 and 68, 27 Nov 50; 35th Inf Hist Rpt, Nar, Nov 50. 39 25th Div WD, Nov 50; 25th Div PIR 131, 27 Nov 50. 40 Ibid. ; 25th Div PORs 67 and 69, 27 Nov 50; 27th Inf Hist Nar, Nov 50. 41 25th Div WD, 27 Nov 50; 25th Div OI 22, 27 Nov 50. 42 25th Div POR 68, 27 Nov 50; 25th Div G3 Activ Rpt, 27 Nov 50; 35th Inf Hist Rpt, Nar, Nov 50; 24th Inf Unit Rpt 57, 27 Nov 50; 27th Inf Unit Rpt 82, 27 Nov 50; 2d Bn, 27th Inf, Unit Jnl, 27 Nov 50. 43 23d Inf Comd Rpt, Nov 50; 23d Inf S3 Jnl, 26-27 Nov 50; 2d Div G2 Msg File, Msg 1341, 27 Nov 50. 45 2d Div WD, 27 Nov 50; 2d Div POR 342, 27 Nov 50; 2d Div G3 Jnl, Entry 197, 26 Nov 50, and Entries 1, 3, 7, 16, 17, and 22, 27 Nov 50; 2d Bn, 9th Inf, Unit Jnl, 26 and 27 Nov 50. 47 2d Div G3 Jnl, 26 Nov 50; 38th Inf Comd Rpt, Nov 50. 48 IX Corps PIR 62, 27 Nov 50; IX Corps G2 Spot Rpts 3108 and 3172, 27 Nov 50; IX Corps G3 Spot Rpt 1830, 27 Nov 50; 2d Div G3 Jnl, 26-27 Nov 50; 38th Inf Comd Rpt, Nov 50. 49 Eighth Army POR 412, 26 Nov 50; IX Corps G3 Spot Rpt 1757, 26 Nov 50; 2d Div POR 342, 27 Nov 50; 2d Div G3 Jnl, 26 Nov 50; 38th Inf Comd Rpt, Nov 50. 50 38th Inf Comd Rpt, Nov 50; Sit Overlay with 2d Div POR 342, 27 Nov 50. 51 2d Div Opn O 11, 27 Nov 50. 52 Eighth Army PIR 138, 27 Nov 50; Eighth Army G3 SS Rpt, 27 Nov 50. 53 I Corps Opn Dir 25, 27 Nov 50. 54 Eighth Army G3 SS Rpt, 27 Nov 50; Eighth Army G3 Jnl, 27 Nov 50; Rad, GX 30039 KGOO, CG Eighth Army to C/S ROKA et al., 27 Nov 50. 56 Eighth Army G3 SS Rpt, 27 Nov 50; Rad, GX 30039 KGOO, CG Eighth Army to C/S ROKA et al., 27 Nov 50; Rad, GX 30038 KGOO, CG Eighth Army to CG 1st Cav Div, 27 Nov 50; 1st Cav Div G3 Jnl, 21-30 Nov 50; 7th Cav Regt Hist Rpt, Nov 50. 57 Eighth Army G3 Jnl, 27 Nov 50; IX Corps WD, 27 Nov 50; Rad, IXACT-396, CG IX Corps to Sn Adv 1st TAFC, 27 Nov 50; Rad, IXACT-390, CG IX Corps to CG 1st TAFC, 27 Nov 50. 58 I Corps PORs 230 and 231, 28 Nov 50; I Corps PIR 74, 28 Nov 50; I Corps Intel Sum 222, 28 Nov 50; 25th Div POR 70, 28 Nov 50; 35th Inf Hist Rpt, Nar, Nov 50; 1st Bn, 35th Inf, WD 28 Nov 50; 2d Bn, 35th Inf, WD, 27-28 Nov 50; 3d Bn, 35th Inf, Nar of Opns, Nov 50. 59 25th Div POR 70, 28 Nov 50; 27th Inf S3 Jul, 27-28 Nov 50. 60 2d Div PIR 70, 28 Nov 50; 1st Bn, 9th Inf, Nar Diary, Nov 50; 2d Engr Bn, Unit Hist Rpt, Nov 50; 38th Inf Comd Rpt, Nov 50. 61 Eighth Army G3 SS Rpt, 28 Nov 50; Eighth Army PIR 139, 28 Nov 50; Rad, GX 30051 KGOO, CG Eighth Army to CG IX Corps et al., 28 Nov 50; I Corps Opn Dir 26, 28 Nov 50; IX Corps Opn O 5, 28 Nov 50; 25th Div 0123, 28 Nov 50; 2d Div Opn O 12, 18 Nov 50; I Corps POR 231, 28 Nov 50; IX Corps POR 192, 28 Nov 50. 62 I Corps Opn Dirs 26 and 27, 28 Nov 50; I Corps PORs 231 and 232, 28 Nov 50; 24th Div WD, Nov 50. 63 I Corps PORs 231 and 232, 28 Nov 50; 25th Div WD, Nov 50. 64 I Corps PORs 231 and 232, 28 Nov 50. 65 IX Corps Opn O 5, 28 Nov 50; IX Corps WD, 28 Nov 50. 66 The account of the 2d Division operations on 28 November is based on the following sources: 2d Div Opn O 12, 28 Nov 50; 2d Div WD, Nov 50; Hist, 9th Inf. Nov 50; Comd Rpt, 23d Inf', Nov 50; 38th Inf Comd Rpt, Nov 50; 72d Tk Bn Comd and Unit Hist Rpt, Nov 50. 67 At least one of the Wawon engagements proved to have been a case of mistaken identity when 125 "prisoners" sent to the rear by the Turks turned out to be members of the ROK 6th and 7th Divisions. The South Koreans apparently moved west after being squeezed out of Tokch'on and blundered into the Turks either ahead of or amidst the Chinese assaults on the brigade. See IX Corps G2 Spot Rpts 3252, 28 Nov 50, and 3301, 29 Nov 50; 2d Div G3 Jul, 28 Nov 50; 2d Div G2 Jul, Entry J-1447, 28 Nov 50; Mono, "Turkish U.N. Brigade Advisory Group, 20 November 1950-13 December 1950," copy in CMH. 68 "Turkish U.N. Brigade Advisory Group, 20 Nov13 Dec 50." 69 5th Cav WD, 28 Nov 50; 5th Cav S2-S3 Jnl, 28 Nov 50. 70 IX Corps G3 Spot Rpts 1962 and 1971, 28 Nov 50; 1st Cav Div POR 378, 28 Nov 50; 7th Cav Hist Rpt, Nov 50; 8th Cav G3 Jnl, 28 Nov 50. 71 Rad, GX 30051 KGOO, CG Eighth Army to CG IX Corps et al., 28 Nov 50. 72 Eighth Army PIR 139, 28 Nov 50; Eighth Army G3 Jnl 28 Nov 50; 1st Cav Div G3 Jnl 28 Nov 50. 73 Rad, GX 30051 KGOO, CG Eighth Army to CG IX Corps et al., 28 Nov 50; Rad, GX 36053 KGOO, CG Eighth Army to CG I Corps et al:, 28 Nov 50; Rad, GX 30061 KGOO, C(; Eighth Army to CO 29th Brit Brig, 28 Nov 50; Rad, GX 30068 KGOO, CG Eighth Army to CG I Corps et al., 28 Nov 50; Rad, GX 30068 KGOO, CG Eighth Army to CG I Corps et al., 28 Nov 50. 74 Eighth Army PIR 139, 28 Nov 50. 75 FEC Intel Dig, vol. 1, no. 4, 115 Feb 53. 76 5th Cav WD, 28 Nov 50; 5th Cav S2-S3 Jnl, 28 Nov 50; FEC Intel Dig, vol. 1, no. 4, 1-15 Feb 53.